There's Nothing quite like a fresh wholesome salsa from Texas. Prepared with only the finest quality ingredients, Jardine's Texasalsa Medium is a true original with a distinctive flavor as big as Texas. 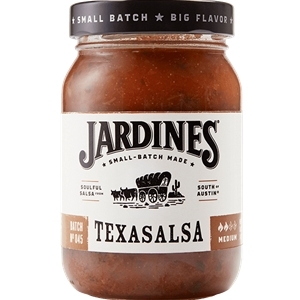 Whether you choose to enjoy Jardine's Texasalsa as a dip, over chicken enchiladas or with your favorite dish, all it takes is one bite, and you'll know why each award-winning jar doesn't last long. Tomatoes in juice (tomato, tomato juice, citric acid, calcium chloride), water, tomato paste, jalapeno peppers (jalapeno peppers, vinegar, salt, acetic acid), fresh onion, distilled vinegar, cinaltro, salt, dehydrated onion, green chile (green chiles, citric acid), dehydrated garlic, xanthan gum (a natural thickener).